To understand how a demand management system works, let’s first look at what demand is and how it relates to your electric use. Demand as it relates to your electric bill might be more correctly called “Peak Demand”. 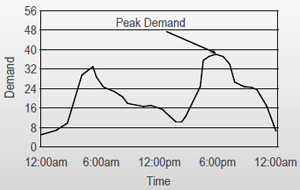 Peak demand is defined as the greatest number of kilowatt-hours used in any one demand interval. The demand intervals are usually 15 minutes, so the typical billing period of 30 days has about 3,000 opportunities to set the peak demand. Think of your electric use divided into 96 “blocks” per day. In each 15 minute block, you have a certain amount of energy usage. Some blocks will have high usage and some low usage. These are the peaks and valleys of your electric use. A simple way to understand this concept is with home energy use. In the morning, when everyone is getting ready for the day, more energy is used to make breakfast, heat water for showers, blow dry hair, etc. In the evening, when everyone is returning home, more energy is used as lighting is turned on, the refrigerator is opened and closed, dinner is prepared, laundry is done and the TV and computer are on. To the right is a graph depicting a typical day’s load profile. As you can see, the peak demand in this graph would have occurred in the evening hours when energy use was at its highest, because one of the intervals during that time had greater use than all others for the month. Once the peak demand has been established for the month, the demand charge is applied to the peak demand to calculate the demand component of your electric bill. So how can you drop to a lower rate or reduce your kW to save money on your electric bills? By using an Energy Sentry Demand Management System. What is a Demand Rate? Utility companies generally have a commercial non-demand rate for small buildings that maintain their demand below a certain kW level, usually 25 kW. This is known as the Small General Service rate class, and is typically less expensive for small commercial customers. To continue to stay on this rate, a customer must ensure they stay below the rate threshold. If they exceed this threshold, they can be moved to the next highest rate class. Medium to large customers that exceed the threshold between rates or cannot stay below that level, are moved to the next higher rate class called Medium General Service (MGS). This rate generally has a demand charge as a separate component on the bill. Using the MGS rate, customers can enjoy substantial savings by limiting their peak demand to the lowest possible level. What is a Demand Management System? It is important to mention that controlled loads are those which can be deferred for a short time, with little or no discomfort, inconvenience, or interruption of a process. A demand management system allows you to level off the peaks and fill in the valleys by spreading out energy use. The same amount of energy is used but in a more efficient manner. This efficiency is rewarded by the price signals and structure of the electric rate. An Energy Sentry acts in a similar manner to the cruise control on your vehicle. You have a speed limit (rate of usage) that you have set, and the Energy Sentry slows or speeds up the rate of usage to keep your peak demand below the level you’ve set. While the Energy Sentry monitors the power used by all loads in your building, it controls only those loads which have some thermal storage, like electric heat, electric water heaters and air conditioners. Most commercial buildings have multiple air conditioning units distributed throughout the building. Instead of all of the units running at the same time, (causing a large peak in energy use) an Energy Sentry controls the different units making them take turns while still assuring the building stays cool. Each building and company is unique in relation to their energy consumption, but the following is a list of typical loads that can be controlled with an Energy Sentry. How will an Energy Sentry Demand Management System benefit me? The best reason for using an Energy Sentry is saving money on your electric bills. On average, the Energy Sentry saves 10-40% of electric bills per year depending on each building’s unique situation and your utility’s rates. Secondarily, Go Green! Everyone agrees that getting better gas mileage in their car is a good thing. The same is true with demand. You’re using the same amount of electricity, but at a dramatically lower cost. Third, demand management allows utilities to manage their operations better thus delaying or eliminating peak power purchases. Previous ArticleUsing Solar & Demand Control to Save BIG!